For thousands of years lavender has been used by many cultures for various applications, with a long history of medicinal, culinary and household use. It has a sweet, floral fragrance that is notably soothing, invoking relaxation. Combined with the classic blend of Earl Grey's citrus and a hint of cream this black tea blend has become a favourite. Lavender has proven itself valuable throughout history even in ancient Egyptian mummification. Did you know lavender was also used for protection from bubonic plague? Which is now believed to be due to its repellent affect on disease carrying insects. Fortunately, much sunnier uses abound including aromatherapy, soaps and of course, in tea. 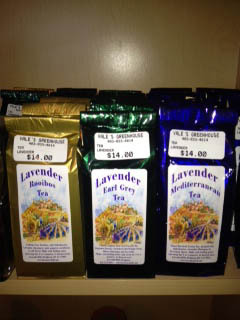 This tea is package in Canada and comes in three varieties, Rooibos Tea, Earl Grey and Mediterranean. The earliest recorded evidence of the production of soap-like materials dates back to around 2800 BC in ancient Babylon. 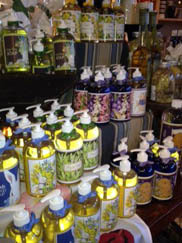 “Liquid Soap” was not invented until the 1800s. “If it was out there that long why did my mother never have this in the bathroom when I was a kid?” “ I had to put up with goopy, half used slivers of something that really I did not want to touch!” These very pretty bottles will really look great next to the sink. Your guests and kids will use it with out complaining. The beautifully dicorated bottles have pretty seasonal pictures for spring, summer, fall and winter. Lavender scent is just strong enough for you to know it is there and the pump will not clogg and run all over. A wonderful product!! So easy. Here at Vale’s Greenhouse we often have people visit us from all over the world. The most common thing for them to buy is one of these charming canvas shopping bags. 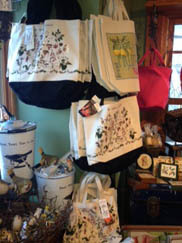 These bags are made in Victoria, British Columbia and have all the Provinical wild flowers on them, making them a real keep-sake. They are made of very durable canvas construction with a water proof bottom keeping the wet in or out. The strong handles let you stuff the bag full and you will get great complements at the cabin or the grocery store. Dress them up as wrapping for a shower, birthday or wedding gift, or just throw in the towel and sun block. Perfect! New and different to our gift shop is honey. We have chosen 4 different kinds to sell and each one is quite different. The Orange Blossom Honey has a special sweet mild flavour that only comes from orange blossoms. The Habanero Honey is a spicy hot honey for the hot food lover, perfect for the person who loves to BBQ. The Star Thistle is a fine mild flavour of honey that has a light appearance with a distinct aroma of anise. Of course there is the lavender flavour, with exceptional taste that is great in tea and spreading on bread. All our honey is beautifully packaged and will make a perfect gift. 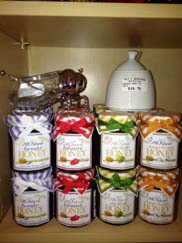 You should also check out our honey pots.